Morning after, Day ahead...: 30 Day Vegetarian Challenge COMPLETE! Since 2008, I've made gradual changes to my diet, first excluding red meat and turkey to most recently only consuming fish, veggies, and dairy. I initially changed my diet due to gastrointestinal issues as I found that when I excluded meat and consumed more veggies, my problems resolved. 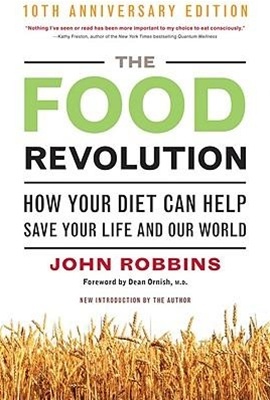 This prompted me to look into vegetarianism more closely and through my search I came across the book The Food Revolution by John and Ocean Robbins. In reading this book, I was made aware of the many health benefits of a plant-based diet, not to mention benefits supported by scientific evidence! So on August 15, 2012 I began my 30 Day Vegetarian Challenge to test my commitment to making such a major lifestyle change. After all, I'm a girl who loves to cook and try new foods and with eliminating meat I knew that this was definitely going to be a challenge. Not to mention, there's only 1 person in my family who is vegan and I'm in a 7 year relationship with a diehard carnivore...so let's just say I knew the odds were against me. For the next 30 days, I read, read, read. With all the myths out there about vegetarianism as far as proper protein intake, and vitamin deficiency, or how expensive the diet was...I wanted to educate myself in order to do it right. I continued to read Food Revolution in addition to various internet sources. I tried new recipes and even got my boyfriend to try a vegetarian restaurant in Chicago called Mana Food Bar. I also watched the well-known food industry documentary, Food Inc, which provided further information regarding the US food industry and the government regulatory agencies which often put profit before consumer health. I completed the 30 day challenge and I'm committed to a vegetarian lifestyle, with plans to eventually become a vegan. I can definitely do without meat but I love cheese and yogurt. So, I'm still working on eliminating dairy. I recently came across another source regarding a plant-based diet called, Forks over Knives, a concept focused on how diet can essentially reverse many of the degenerative and preventative diseases that plague many Americans. More information to come, as I just ordered the DVD and some of the books off their website. I'm now a vegetarian because of the health benefits which are scientifically proven, my personal resolution of gastrointestinal issues, and my concern and distrust in the US meat industry. As I continue on my new path, I look forward to sharing health information and tasty recipes on my blog.